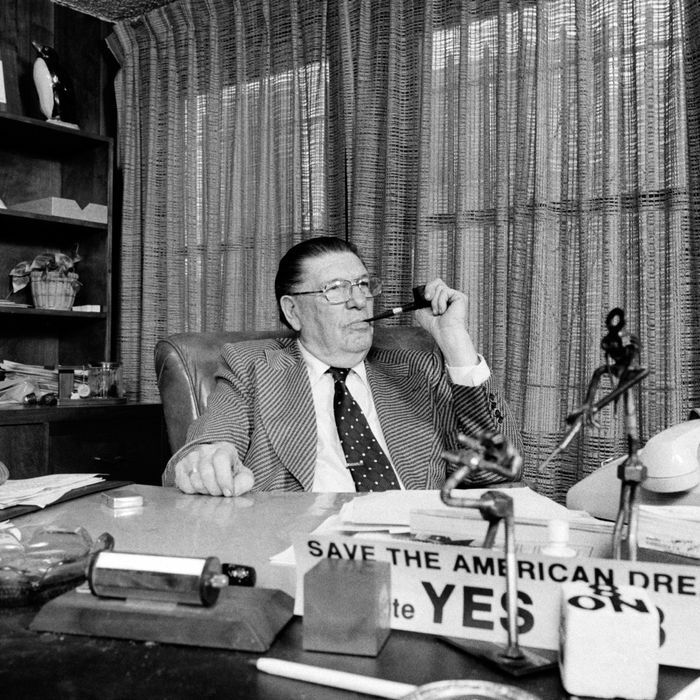 Prop 13 originator Howard Jarvis would probably be happy with efforts 40 years later to expand real estate tax breaks. Ballot initiatives are a central fact of political life in California, dating back to the Progressive era when they were a token of “direct democracy.” But initiatives backed by wealthy and powerful interests are often not progressive at all. A case in point is perhaps the most famous California ballot initiative of all, 1978’s Proposition 13, which capped both commercial and residential property tax rates and limited reassessments so long as properties stayed in the same hands. Originally a “tax revolt” measure aimed at immediate relief for middle-class homeowners, over its 40 years Prop 13 has had a huge negative impact on the property tax base for local services like schools, while arguably limiting the housing supply by discouraging resales. It has helped make California unusually dependent on income taxes, and has offered its most abundant benefits to the very wealthy. It’s also a political sacred cow. And faced with an ever-acute housing shortages, California’s Realtors are not challenging Prop 13, but instead fighting to expand it, by taking a loophole in the original system that allowed property owners over the age of 55 one home sale without losing Prop 13’s benefits, and instead making it unlimited. The nonpartisan Legislative Analyst’s Office has estimated the change would cost local governments and schools a combined $300 million a year, with costs rising to $2 billion annually over time. Whether it makes sense or not, and even whether it passes or not, the new initiative will have one pretty sure effect: boosting voter turnout among its beneficiaries. Even in California, wealthy people over 55 are disproportionately likely to vote Republican. This makes two major ballot initiatives — the other being a measure to repeal the 2017 gas tax increase the Democratic-controlled legislature passed — that could help get Republican voters to the polls in November in defiance of a Democratic wave. This situation is a disappointment to progressives who at one point thought they might certify a ballot initiative to repeal elements of Prop 13 for commercial real estate owned by large corporations. That effort has now been postponed until 2020, when proponents think a presidential contest will create a more favorable electorate. For now, the Realtors’ initiative is one that will consume a lot of money and attention that might otherwise go to contests for office. But that’s become pretty normal in California.